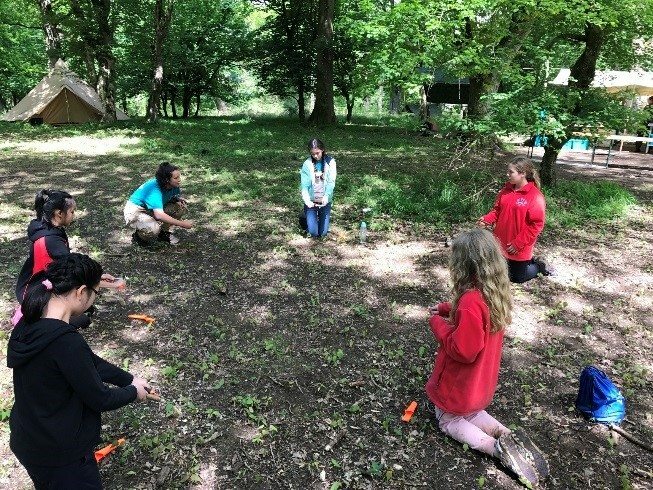 In May, Year 8 ventured into the Oxfordshire forest to experience a three day camping residential with the Bushcraft Company. We arrived at school early on Wednesday morning, with the heavens pouring down on us! It was the wettest day Northampton had seen in months, and the rain was forecast for the entire day. After a relatively short journey, we arrived at Cornbury Park ready for our hike into camp. We trekked through the muddy forest, being very careful where we walked so as not to lose our balance or risk ending up face planting in the mud! The hour long walk was worth it though when we arrived at our beautiful camp site – big white tee-pee style tents surrounded the camp site, a bonfire under a giant parachute was the centre piece, with a kitchen to the side of the site. The pupils sat around the camp fire, ready to be briefed for their three days in the woods. The rain continued to pour down! However, our pupils worked their socks off! They started off by getting into their tribe groups, and created a tribe identity. They attempted to build fires – some being successful, others not so, but all enjoyed the experience. They played woodland games – predator and 21 soon became favourites. These games were made even more exciting when it was time for camouflage and concealment. This involved the pupils covering themselves in face paint and mud, and diving into long grass, ditches or hedges, or ducking behind trees. After a quiet night in the tents, the next morning brought sunshine – perfect weather for a swim! The pupils hiked down to the nearby lake. Although freezing cold, and having to be squirted with a toy water gun before entering the water, most of our Year 8s braved the conditions and enjoyed jumping in and having a swim. While some swam, others enjoyed the weather and sat at the side, with their feet in the water. Some even ventured to a stream nearby and had fun cray fishing. When we went back to camp, it is was time to prepare lunch. Miss Macken and Mrs Goody had a lesson in filleting a salmon, while the Year 8s watched in amazement, as the teachers popped out the fish’s eye balls and removed the bones, ready for it to be panassed over the open fire. Six of our Year 8s tried their very own “bush tucker” trial and had to chew and swallow an eye ball. All succeeded! In the afternoon, pupils learnt how to correctly use a knife and use it to create a tent peg. Pupils then had the opportunity to watch and learn how to successfully skin a rabbit. They watched our tribe leader Jodie perform this, learning about the internal organs of a rabbit also. Then it was the pupils’ turn to give it a go! Many of them did, and despite the smell, they learnt a huge amount and found the experience very interesting. Rabbit skinning wasn’t everyone’s cup of tea, and while that was taking place, many pupils made tribal bracelets which they got to take home as a momento of the trip. That night was pizza night, after an extremely busy day. This was welcomed by the pupils, as they chose their own pizza toppings and watched their pizza cook in outdoor pizza ovens – very cool! Following pizza night, it was time for Tribes Got Talent. Each tribe had been rehearsing and it was their opportunity to perform in Tribes Got Talent. The teachers were the judges and were treated to some interesting performances! The final day brought first aid skills and survival SOS. The pupils learnt about the different skills needed to perform basic first aid. They put their partners into the recovery position and learnt what to do in a real emergency. The pupils were then taken on a hike through the woods. However, while walking they stumbled across a makeshift “accident” in which some of the teachers had been injured. The pupils were able to put their first aid skills to the test, rescuing the teachers and bringing them to safety. They returned to camp for their final meal and ensured the camp site was left spotless, performing a “leave no trace” activity. More predator and 21 were played and then it was time for the hike back to the bus. Despite it being a muddy and very wet first day, the Year 8s threw themselves into all of the activities. They enjoyed learning the various outdoor skills, listening to and attempting to solve riddles, playing outdoor woodland games and experiencing the outdoors. A very successful trip and well done to our Year 8 pupils!